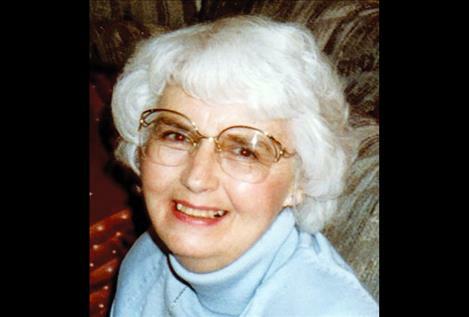 POLSON – Sylvia Vivian Lucara, age 95, passed away on Wednesday, June 13, 2018, at St. Luke Hospital in Ronan. Vivian was born on Aug. 8, 1922, in Red Lodge, Montana. She attended a one room school house in eastern Montana and graduated from Red Lodge High. She briefly worked in Yellowstone National Park before marrying Francis Joseph Lucara, who preceded her in death after 65 years of marriage. Vivian was a mother to four children, eleven grandchildren and nine great-grandchildren. She had many stories, a self-proclaimed philosopher, mostly folk tales about each child and grandchild. She liked to tell stories. Vivian could put together a thought-provoking, fun and gracious poem with little or no effort. They are treasures. Vivian, known as the “goat woman of Polson” milked her goats for the family, grandchildren and people of Polson. She sewed the prettiest dresses, canned all the food they raised, cooked beautiful meals, all for the betterment of the family. Frank and Vivian’s life together (they were truly friends) was as full as anyone could imagine. Working side by side they inseparably built their life on a foundation of love, which included camping, fishing, hiking, exploring caves, and huckleberry, chokecherry and morel mushroom picking. Later all the grandchildren enjoyed these pleasures with them. We thank them from the bottom of our hearts for their hard work. Together they acquired a parcel of land with no trees or water and built a near paradisiac estate we have all enjoyed and utilized to the fullest for over 50 years. Vivian’s life was full; her faith and her hope for the future were genuine. She looked forward to Jehovah’s Kingdom under Christ’s rule to take place, where all mankind will live together in peace forever: Revelation 21:3,4. This hope, firmly grounded in God’s inspired Word, the Bible, she shared with all she met for over 65 years. She is survived by her son, Francis David Lucara; and daughters, Anita Peek, Lynette Dupuis and Vondanette Azzert. Memorial services will be held on Saturday, June 23, 2018, at 2 p.m. at the Polson Kingdom Hall of Jehovah’s Witnesses. Memories and condolences may be sent to the family at: www.thelakefuneralhomeandcrematory.com.